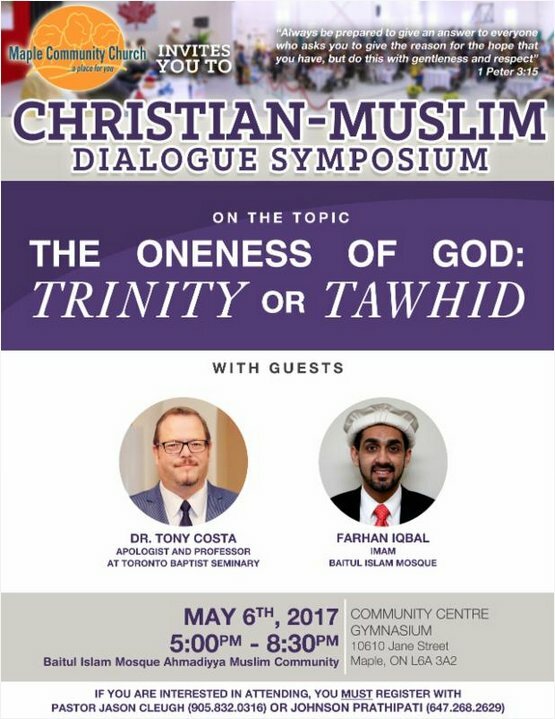 I will be engaging in a dialogue with Farhan Iqbal this coming Saturday May 6, 2017 in Maple, Ontario, Canada. The subject of the dialogue will be the Oneness of God. Is God a Trinity or is He an absolute monad, like Plato's conception of the divine? The Qur'an teaches that Muslims and Christians worship the same God (Qur'an 29:46), but do they? Is the one true God a Trinitarian Being, or a Unitarian Being? He cannot be both. Christians hold to the former, and Muslims hold to the latter. If Muslims and Christians are not worshiping the same God, then the Qur'an is false in its assertion that we worship the same God. If it is wrong on this central subject, is it wrong in other areas, such as its views of Jesus and the Bible among other things?